The VaxArray Influenza Potency test is 24x faster and 100x more sensitive than SRID. In contrast to SRID, these test kits are available for year-round use – even prior to reference reagent availability. The easy-to-use test kits are based on multiplexed sandwich immunoassays that accurately quantify the potency of influenza vaccines within 2 hours. 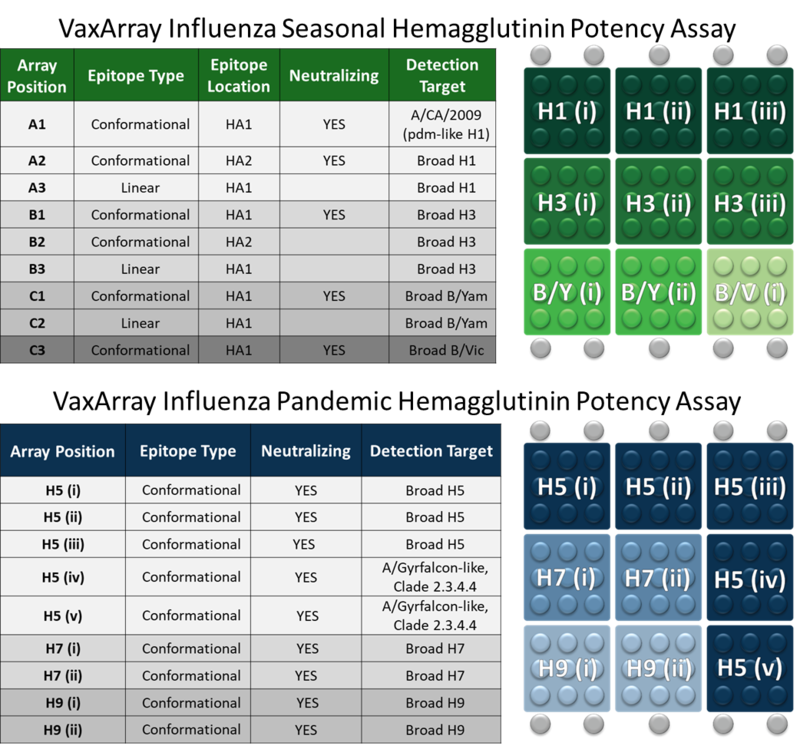 The test kits rely on broadly reactive yet subtype specific monoclonal antibodies in a microarray format. This innovative multiplexed system enables simultaneous analysis of multiple antigens within vaccines, significantly reducing cost and testing time. VaxArray reagent kits are manufactured under cGMP conditions within ISO 13485:2016 certified facilities. The operational software is 21 CFR Part 11 +Annex compatible. 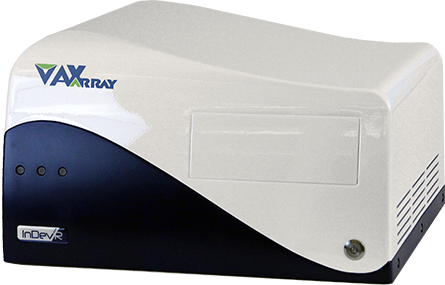 The VaxArray Imaging System (VX-6000) is a compact instrument that enables high-resolution fluorescence imaging of both microarray slides and 96 well plates. The system is sold with intuitive 21 CFR Part 11 +Annex compatible software for use with the VaxArray Influenza potency test kits. Each kit comes with two, 16 microarray slides and enables quantitative analysis of up to 24 samples or qualitative analysis of up to 32 samples. With two exceptions, the kit contains all of the ancillary reagents needed to conduct the assay (e.g., wash buffers, protein blocking buffer, etc.). Reference Antigens. The user must identify and obtain an appropriate reference antigen, which can be an ERL-approved standard or an internal standard characterized by a purity adjusted total protein method. Choose the Best Fluor-Tagged Antibody Label. The user must select and order the appropriate fluor-tagged label antibody from the range offered by InDevR. In general, for egg-propagated vaccines we recommend the nearly universal polyclonal vaccine (VXI-7601) for ease of use and broad applicability. For cell-propagated vaccines, recombinant proteins, or virus-like particles, it is recommend that you review the Label Selection Guide or, better yet, speak with our scientists about which label antibodies to try. It is sometimes necessary to evaluate a panel of label antibodies to optimize sensitivity. 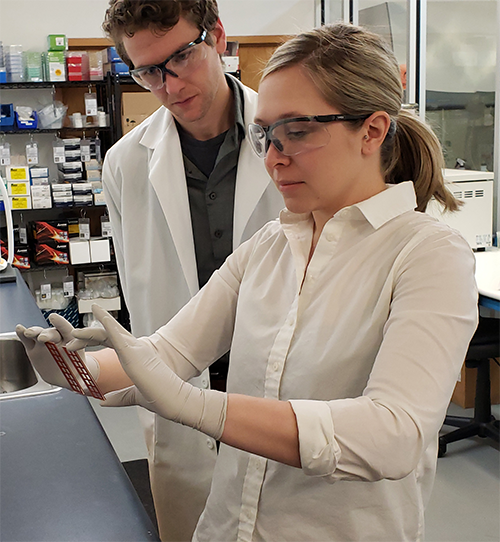 VaxArray can be used to track hemagglutinin at each step in the manufacturing process, from seed strain optimization to monovalent bulk stability assessment during storage. Implementation of a single, consistent potency assay throughout the production process allows for accurate evaluation of protein recovery and process improvements. For final formulation and lot release testing, VaxArray exhibits equivalence to SRID when calibrated with appropriate reference reagents (see recent publications). Since VaxArray does not rely on reference antisera, it can be applied early in the manufacturing process to reduce risk by enabling accurate potency evaluation prior to reference reagent release. The VaxArray potency test relies on a sample pre-treatment step with a detergent (typically zwittergent 3-14) to ensure consistency with the forms of HA detected. This step allows the test to be applied to whole viruses, split viruses, subunit vaccines, and recombinant protein vaccines. Compatibility with the latest strains of flu viruses…The monoclonal antibodies (mAbs) used in the VaxArray potency test kits are selected to exhibit broad coverage and to reliably quantify subtypes from the most current strains of influenza viruses. We work closely with scientists at the FDA and CDC to test new viruses as they emerge to ensure that the mAbs within each test kit are responsive to new strains. From time to time it will be necessary to update the mAbs and InDevR has developed a standard V&V process to do so. We will work closely with our customers to ensure that test kit versions are available as needed for internal V&V activities. 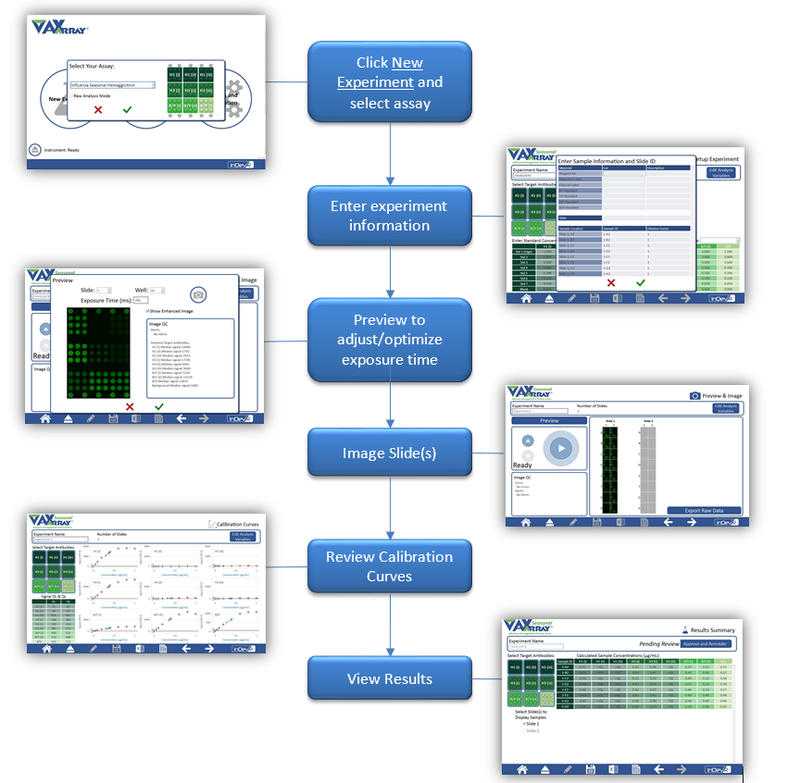 The VaxArray system provides a user-friendly interface for automated data analysis. Automated analysis reduces time spent collecting data and eliminates subjectivity through a standardized data processing algorithm. The software is compatible with 21 CFR Part 11 + annex for easy integration into your process for ensuring data integrity. A5) Please refer to the Label Selection Guide for Seasonal or Pandemic for more information on which label antibody is best for your sample and needs. The team of InDevR scientists will also be happy to help you to select the appropriate antibody for your specific sample and analysis needs. The polyclonal label is the most flexible and is appropriate for most samples, while the monoclonal labels tend to be more sensitive to protein structure and provide better coverage for some sample types, such as recombinant proteins.